Adam Pelzer’s obsession with Cannondale CAAD series bikes runs deep. Earlier this year I met Adam at Brisbane’s Gallery of Modern Art to photograph his Cannondale CAAD4. Just months later Adam was back again at the same location. With a sense of déjà vu this time round Adam was hauling another CAAD series Cannondale out of his car, but this one was a radically different beast, reportedly ridden by an equally qualified animal. You might remember Adam from the last story about his Saeco Cannondale CAAD4, Adam’s the guy who once jammed his arm through a Spinergy front wheel while riding at speed. A huge fan of Mario Cipollini and dyed in the wool Cannondale Aficionado, Adam had found a Cannondale that he’d only ever dreamed of. The instant Adam saw this bike he just had to have it. A late 1990’s CAAD3 team Saeco Cannondale Time Trial bike with the serial number CIPOATT7, with completely original parts from it's last days of racing in 1999 - 2000. This Cannondale TT bike is fitted with the components from the exact moment when the bike crossed the finish line, for it's last ride with Mario Cipollini on board. Adam received the bike in totally original condition, all parts intact, all he had to do was give the bike a tidy up with new cables, tyres and bar wrap. 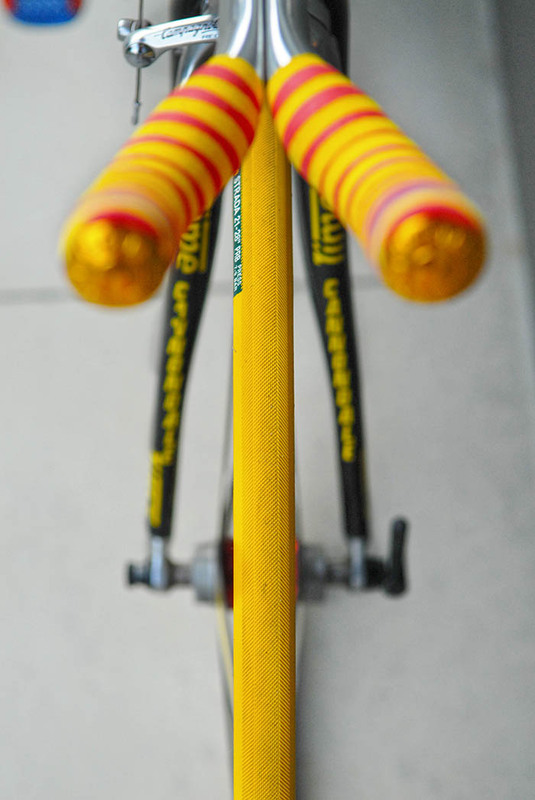 The top tube has Cipo's name on it. It’s the right size with the right serial number and it’s built with all the hallmarks of a race bike prototype. “Our rapid prototyping process lets us turn Monday’s feedback … into rideable prototypes for Tuesday. Modifications suggested by our racers get plugged into CAD/CAM computers that redirect the lasers that cut and shape individual frame tubes. The modified, self-fixturing tubes are then welded into prototype frames. The speed and ease with which we create prototypes lets us continually improve our existing bikes, and deliver innovative new 'edge-of-the-art' models with speed that our competition can’t even begin to match." You couldn’t buy a commercially available Cannondale time trial bike like the Saeco Cannondale custom time trial bikes. The nearest thing in the catalogues were “multi sport bikes” aimed at the triathlon market, these bikes resembled road bikes with clip on aero bars. The 1999 Cannondale Catalogue shows Ivan Gotti testing a team prototype time trial bike in the Pinninfarina wind tunnel in preparation for the 1998 Tour de France. An almost identical bike to the one Adam had presented for me to photograph. The team Saeco Cannondale time trial bikes were so radically different to any other Cannondale available, they could only be custom made and team issue. Especially with a serial number like CIPOATT7. Custom CAAD series Cannonale Saeco team bike for Mario Cipollini, based on the CAAD 3 bikes and probably built in 1997. Complete custom geometry for team issue only. From the onset Cannondale had made a significant departure from traditional frame building. Using smooth tig welded 6000 series aluminium produced by Alcoa was the standard process for Cannondale. Alcoa called their product Alcalyte. On the Saeco Cannondale team bikes, lugless fillet brazing was used to join the large tubes. This process was outlined by Cannondale in 1992 in a diagram produced by Dorling Kindersley publishing, showing an almost identical frame to the Saeco Cannondale time trial bikes. Where tubes join at awkward angles like the head tube, top tube and down tube junction on the custom team TT frames, the fillet brazing is heavily built up. Cannondale used 6000 series aluminium for it’s ease of use when being shaped and machined. Tubes were laser cut and designed with a “tab and slot” system, eliminating the need to build production fixtures, thus significantly speeding up production. After welding, the frames were heat treated for retention of strength while using thinner tubes, then welds sanded smooth. Next frames were electrostatically painted. This was an era of divergence away from traditional methods, using materials developed for the aerospace industry, lugless frame joints and new methods for paint finishing. These technologies weren’t limited just to frame building. Cannondale introduced their own CODA components range in 1993 and this is where the prototyping continued. The most conspicuous prototype component on the Cipo TT bike is the Magic Motorcycle crankset, a complete design revelation in itself. Marked only as CODA, the crankset does not give away it’s Magic Motorcycle origins, invented and originally prototyped by Alex Pong. Alex and his son Skooks Pong manufactured the first Magic Motorcycle cranks from solid CNC machined 7075 aluminium alloy blocks. 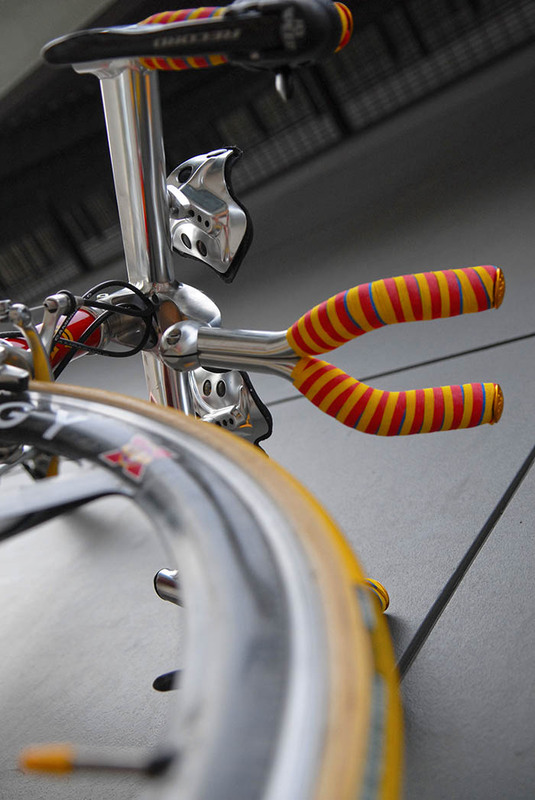 The crankarms were hollow and finished with a range of anodised colours, incorporating a svelte aero shape. Alex Pong completely re-designed the bearing units with a new outboard design where the bearings were seated in an oversized housing outside the bottom bracket shell, complimented with a splined and tapered press fit system. Pong struck a deal with Cannondale in the early 1990’s and the Magic Motorcycle cranksets were incorporated into the CODA components lineup. Next on the Saeco Cannondale Cipollini TT bike customised components list is the Cinelli Angel bars. While Adam was finishing off the build to get the bike to 1999 Tour de France specification, he found that the Angel bars had been cut and hacked by team mechanics to get them race ready, no special treatment here. Then there’s the choice of Cipo pinup girl for the stem. Readily available for Cinelli Alter, Integralter and Angel stems, Cinelli produced the pinup girls, Air Force Girl, Texas Girl, Cosmic Girl and Beach Girl clip on stem enhancers. Other notable components which give away the prototype origns are the Campagnolo Record rear derailleur and the Campagnolo Record brake levers. 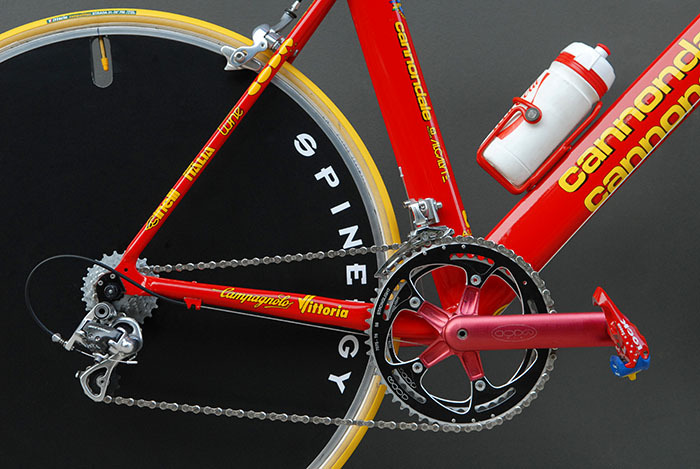 The Campagnolo rear derailleur is the first of the ten speed Campagnolo derailleurs introduced in 2000 and the brake levers were the first ten speed ergo power units, making the drive train ten speed on a 1999 bike. 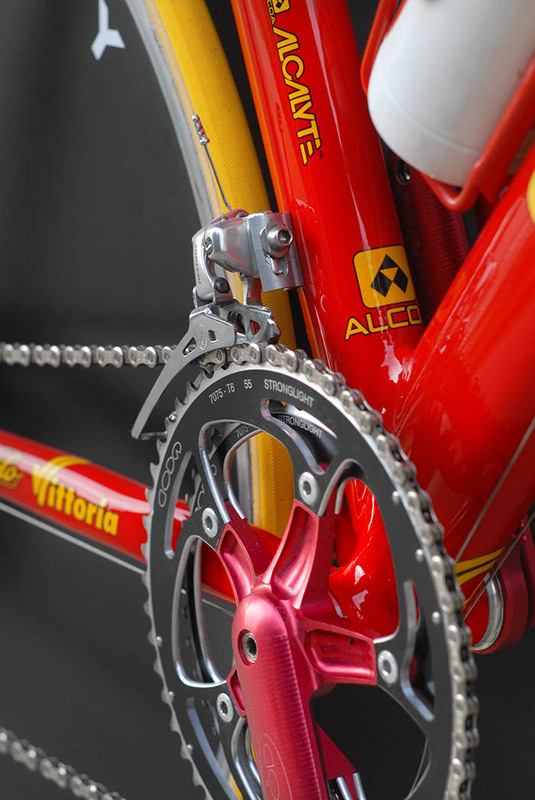 The Campagnolo C Record front derailleur is still a 1999 version. 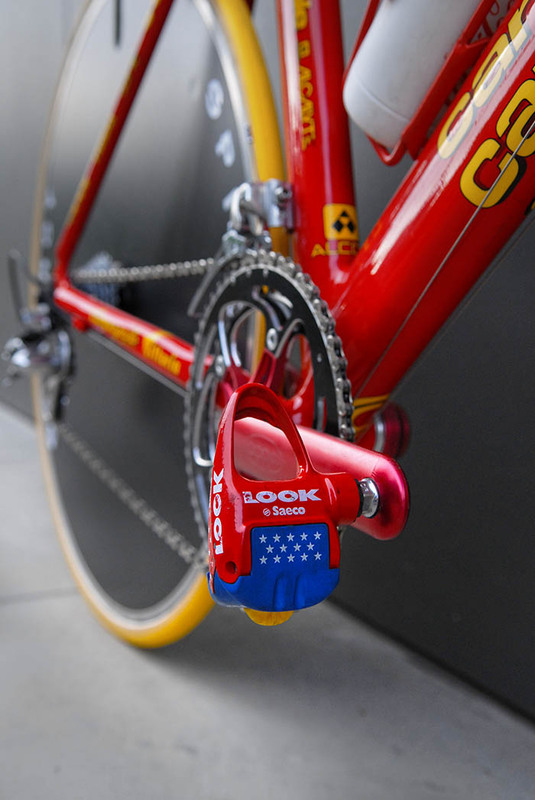 Adam reckons this bike is setup for use in 1999, so either the derailleur and brake levers were given to Cipo for testing, or the bike was still in use in 2000 and fitted with the ten speed drive train. All this before starting it’s life in the hands of bike collectors. Another prototype detail is the CAAD3 frame which was built in 1997 and still in use in 1999. Obviously different components were swapped out over time while these TT bikes were in use. 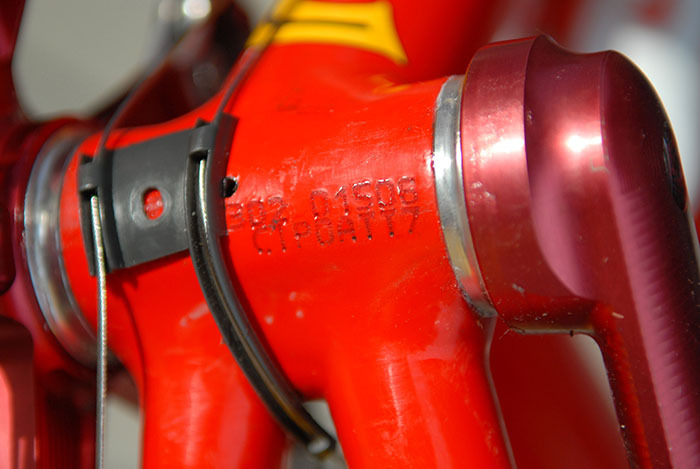 Even the seat post is a Shimano 600, the best fit for the 27.0 seat tube on a Campagnolo components team bike, where no other post was available. Adam’s Saeco Cannondale CAAD 3 Team Bike Story. It was the usual story, a late night bleary eyed search online. Of course I had no money but despite that, tried to get on it right away, I just knew that I had to do what it took to get it. It’s a nice looking TT bike so when I went to bid on it I didn’t even have a final price in mind. Cool looking 90’s bikes like Pantani Bianchi’s and Giant TCR’s from ONCE, I reckon they look flash so just maxed it out on the Auction and I ended up getting the bike. The seller who was in Germany he knew it was a team bike but it didn’t seem to have any importance, to him it was just another bike. I tried to get some history on the bike but nothing was forthcoming. Most of the parts are from 1999 plus it’s a custom CAAD 3 TT with full custom TT geo. Cannondale didn’t make a time trial bike, so this Saeco Cannondale has to be team issue, plus it has Cippo’s name on it and the BB is stamped CIPOTT. The frame was built in about 1997 still used in 1999. 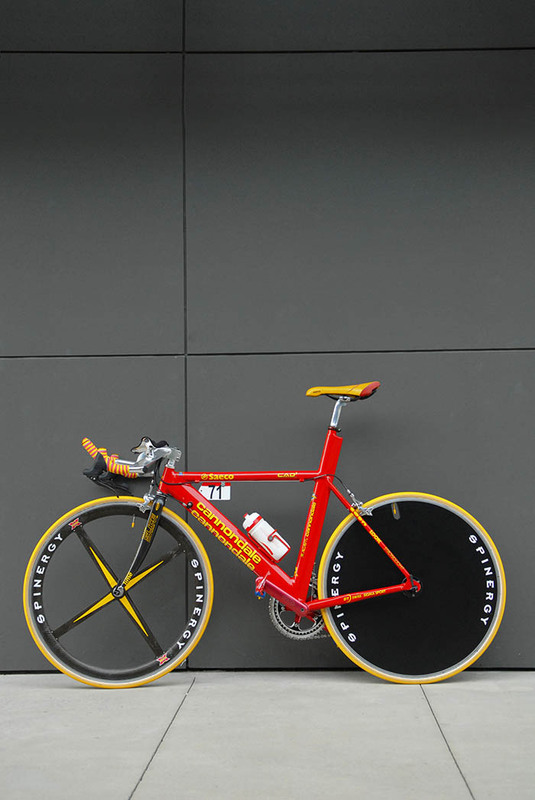 Road CAAD 3 frames had all threaded forks, whereas this TT bike is all threadless AHEAD. Even early CAAD 4’s were threaded. Another interesting detail are the Coda - Magic Motorcycle cranks with an outboard bottom bracket, it’s one of the first brackets using this design, it’s super light and has an Italian thread. Every Cannondale I’ve ever worked on is English threaded, not Italian. In years previous to 1999 Cannondale were running Shimano components and the Shimano 600 seatpost could have been left on the bike from that time. This Cipo TT bike has an original Slice Time Coda fork exactly like the forks used on Cannondale team road bikes at the time. To find a team frame that has all the right decals including the team sponsored decals in the right place and proper clear coats is unbelieveable. I knew it was a proper team frame once I saw the decals. The bike also has the proper threaded race number clip. I’ve been riding, selling, collecting and building Cannondales for more than fifteen years, yet there’s stuff on this one that I’ve never seen after all that time. You think you’ve seen it all and then one like this comes along. Hold your horses, it’s just a matter of time before Adam will be back with another Cannondale CAAD series story, déjà vu all over again. All photographs by Robert Cobcroft. With thanks to Adam Pelzer for putting another fine machine before my lens. 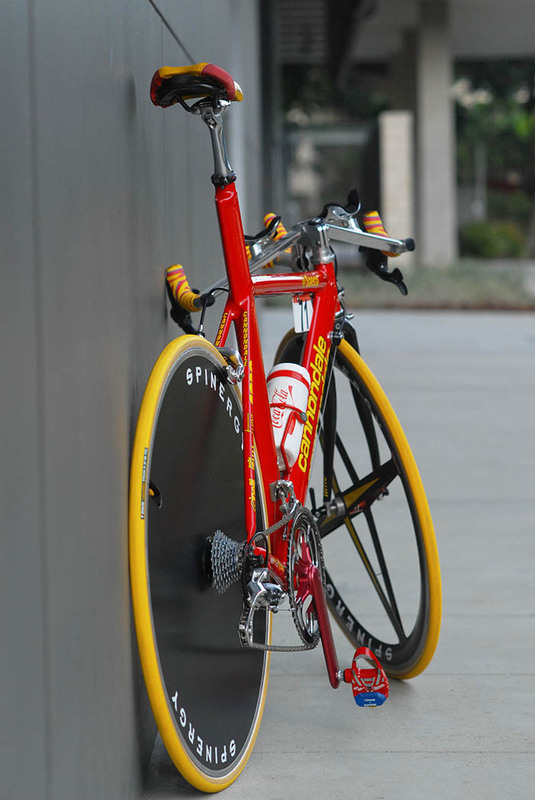 Mario Cipollini 1999 team issue Saeco Cannondale custom time trial bike. Spinergy Rev X front wheel. Coda Cannondale Magic Motorcycle crankset. Red team issue Saeco Cannondale Look PP 396 pedals. Time Carbon Slice fork for Cannondale. New for 2000 and probably tested in 1999, Campagnolo Record ten speed drivetrain. Red white and blue Saeco Cannondale Look PP 396 pedals. 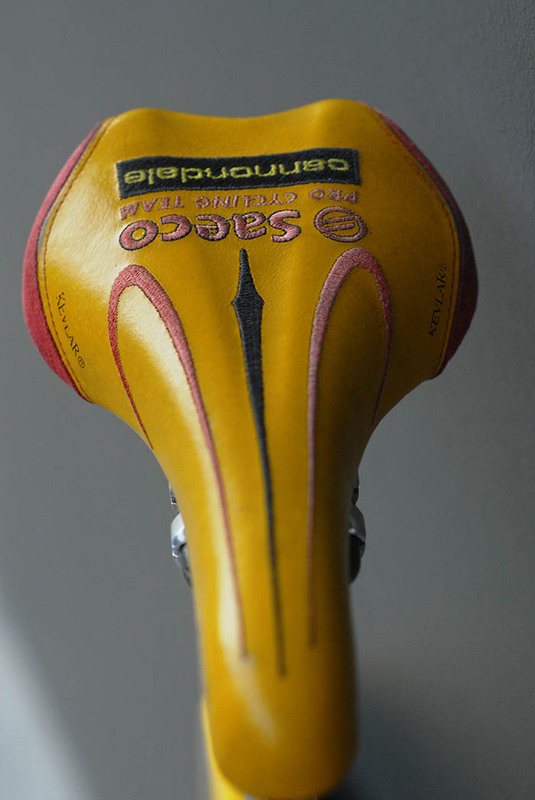 Saeco Pro Cycling Team Coda Cannondale custom saddle. Cinelli alter stem graphics with flying pinup girl, integrated into Cinelli Angel one piece bar / stem combo. Shimano rear disc, matched to Spinergy front with some handy decal work. HANDLEBARS and STEM Cinelli Angel integrated one piece, savagely cut, sawn, hacked and customised by team mechanics. 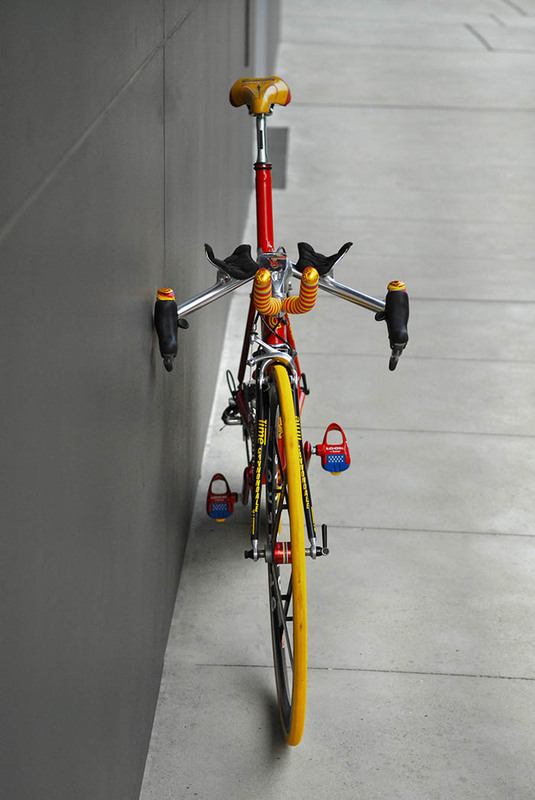 With Cinelli arm rests and Cinelli bar plugs. Stem finished with Alter graphics and flying pinup girl. Spinergy front wheel with the stiffest of stiff wheel stiffeners. Usually Cannondale finished their bottom brackets with English threads, this bracket is Italian threaded. Also a first from Cannondale with an outboard BB setup designed and prototyped by Alex Pong from Magic Motorcycle, a man well ahead of his time. 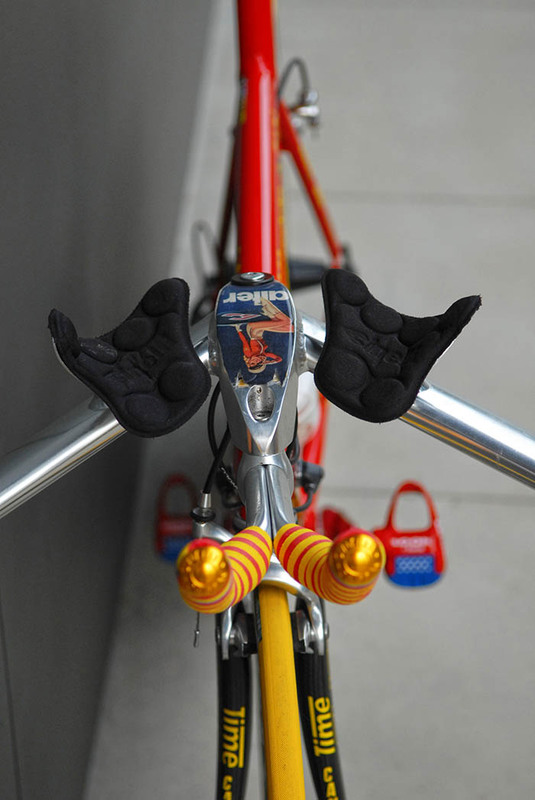 Cinelli arm rests and Cinelli Angel bar stem combo, capped with Cinelli - Cannondale bar wrap and bar ends. Mario Cipollini Cannondale team issue custom team time trial bike. CAAD3 built in 1997 for following racing seasons. 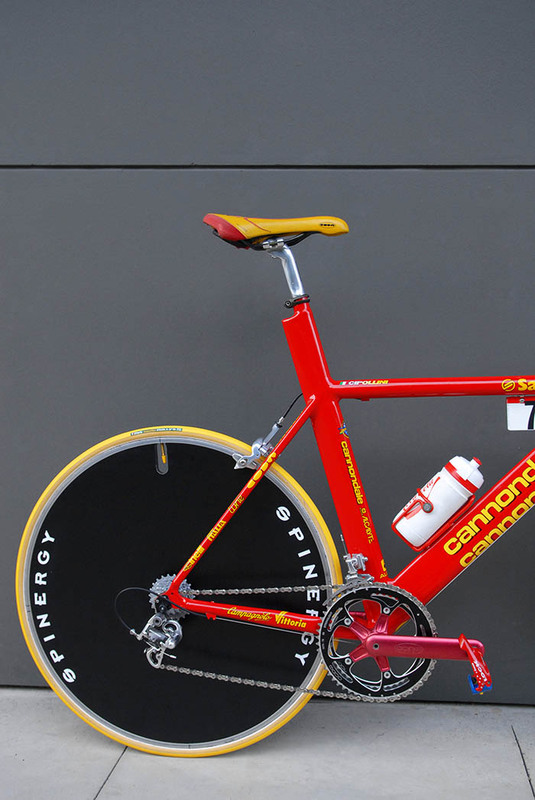 Mario Cipollini team issue Saeco Cannondale time trial bike, 1999. Bearing the Cannondale makers mark CIPOATT7 team issue bike with custom serial number smashed over the top of another BB number. 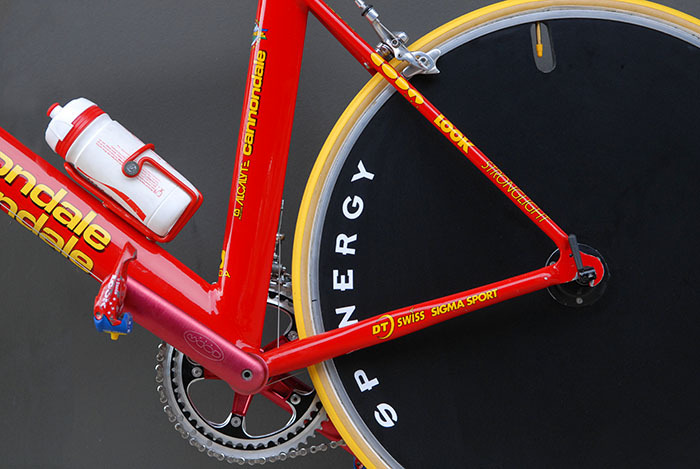 Mario Cipollini's time trial bike or spare bike from 1999 Tour de France. Cipollini RB 1000 road bike, Cippo tests his creation on his favourite descent near Lucca.